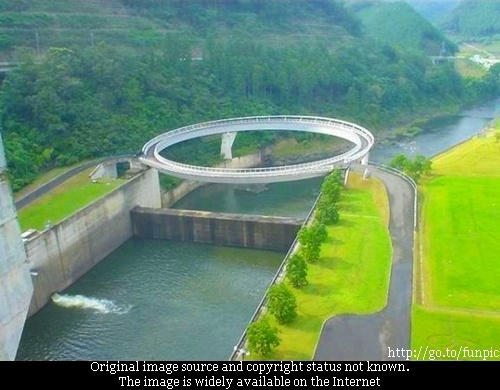 This strange looking round bridge has been a topic of discussions in many forums for last 3/4 years. Most of the forums called it a fake bridge, as it is very convoluted way to cross the water channel. Why make a circle, when a simple bridge would have served the purpose? No one was sure whether the bridge is real or is a digitally created fake. Even Snopes - the best-known web portal for discussing urban legends, Internet rumours, e-mail forwards, and other stories of uncertain or questionable origin and for validating or debunking such stories has inconclusive discussions about the existence of the bridge. 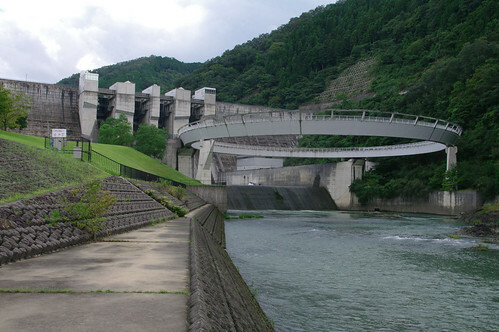 Recently (May 13, 2010) 'Proofreader', a member of Google Earth Community (GEC), made a post about this bridge in Fun & Games forum of GEC. He felt that the bridge may be fake yet the landscape itself should be real and wanted to know where this spot is located. The regular posters in Fun & Games section of GEC are experts in finding almost any spot in Google Earth and within a week 'Mapmaniac', another member of GEC came out with a conclusive proof that the bridge does exist and is not a fake. 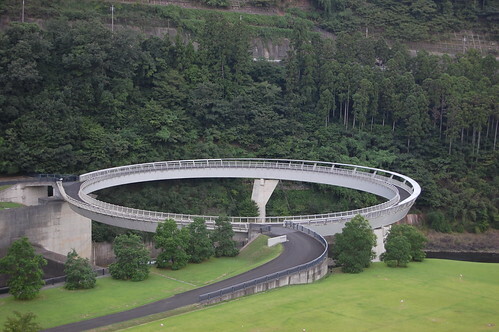 This unique circular pedestrian bridge is located at the foot of the Hiyoshi dam near Kyoto, Japan. It is part of Hiyoshi Spring spa resort and was designed by Japanese architect Norihiko Dan, who also planned the landscaping of the spa resort and park. Built in 1998 the bridge known as 'Friendship Bridge' has a diameter of 80 metres. Credits: 'Proofreader', whose post in Google Earth Community brought this bridge my knowledge and 'Mapmaniac' who found it in Google Earth, without which I wouldn't have made this post. Thank you 'Proofreader' and 'Mapmaniac'. hello looking forward to come to india. Hello Ayaan - looking forward to your visit. This bridge is for fun, specially for children who love to run in circles playing catch me if you can! I am surprised that in spite of overwhelming proof I have given in my post you still call it "Fake!!!!!" Even if we assume that all the images by different persons from different source are fake, but to assume that Google have also faked the map is preposterous. I am sure readers of this blog will definitely be interested to know the basis of your statement. 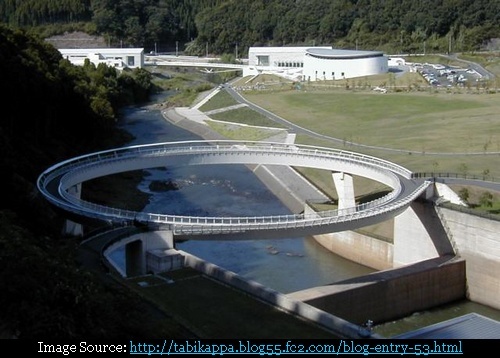 What is the purpose of designing a round bridge like that? Come to think of it, the designer is not an idiot to choose the design for JUST the aesthetics. There's gotta be some functionality... I'm impressed anyways.